How do these changes apply to you? If your home is solely your principal residence for each year you have owned it, you may not have to pay tax on the gain! 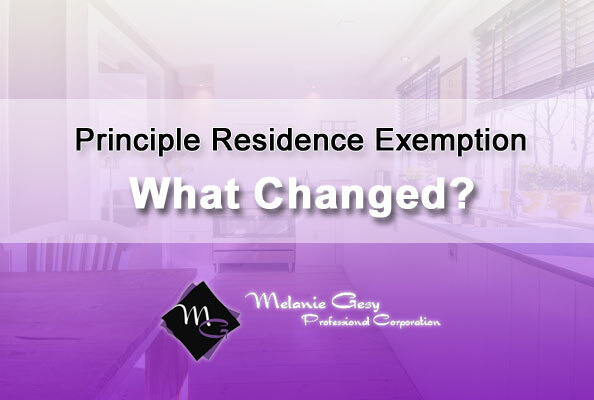 The principal residence exemption is an income tax benefit that provides each person an exemption from tax on the capital gain when their property is sold. If the property was your only principal residence for every year you owned it, the tax on the gain does not have to be paid by you. Before 1982, one spouse could designate one property as their principal residence while another family member could designate another. How does a property qualify as a principal residence? In years previous to 2016, if you sold your home/property and it qualified as your principal residence for each year you owned it, reporting the sale to claim the exemption wasn't needed. At the start of the 2016 taxation year, you are now required to report the disposition and designation of your principal residence on your personal tax return, whether or not you qualify for the exemption. In 2016, you had to report the sale on schedule 3 - Capital Gains or losses. In 2017 and later years, you must report schedule 3 paperwork and complete T2091(IND). If you do not report any changes on your return, an open-ended reassessment period will begin and you may face late-filing penalties. Do you rent out part of your home? Many Canadians often turn an unfinished basement into a basement suite to rent out or even have a family member rent a room while they attend school to save on costs. Adding a secondary rental suite could hurt your ability to claim the principal residence exemption when it comes to selling this property. Do you Own a Farm? If you own a farm and sell part of the land that is used for the farming business and includes your principal residence in 2017 then only part of the property's gain is taxable. Visit the Government of Canada website to learn more about how this change could apply to you! For any questions or concerns please call 780-995-5236!